The government, which was sworn in Tuesday, was \”an attempt to hinder the national dialogue which is already facing troubles,\” said Rabah Muhana, a leader of the leftist movement based in Gaza. He also said the time of announcing the government was \”bad and wrong\” since it came before President Mahmoud Abbas\’ Fatah party and Islamic Hamas movement reach a reconciliation deal. 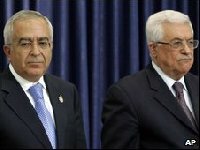 Abbas asked the Western-backed economist Salam Fayyad to expand his West Bank-based government which was first formed in June 2007when Hamas routed pro-Abbas forces and seized control of the Gaza Strip. Hamas, which now controls Gaza with no political unity with theWest Bank, said it doesn\’t recognize Fayyad\’s reshuffled government. Hamas, which won the parliamentary elections in 2006, controls the Gaza Strip with its own regime isolated by Abbas, Israel, most of the Arab countries and the Western world.